Conditions Comments: Prefers well-drained soil and full sun. Requires mild winters. Regular watering necessary to establish it, but once established within its natural range, it can be left on its own, making it a popular highway planting in the Valley." Here is an article from the Master Gardeners of the University of Arizona Pima County Cooperative Extension on the Texas Olive. If they tell you it will grow where you are, you can probably believe them, but do note the cautions about planting it in full sun and in a sheltered location. Description: Plant seed fresh or double-stratify. Take softwood or semi-hardwood cuttings in summer. Seed Collection: Collect seed when it becomes muted yellow-white or pale brown with interior seed plump and hard. Clean and air dry before storage in cool, dry location. Seed Treatment: Varies with locale and climate. Maintenance: Requires much water to get it established but once established it is drought-tolerant." 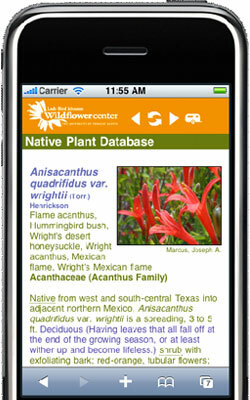 If you are still having difficulty locating a source for this tree, go to our National Suppliers Directory, put your town and state or just your zipcode in the "Enter Search Location" box, click on GO and you will get a list of native plant nurseries, seed companies and consultants in your general area. July 21, 2005 - My Turks cap lily has dark pea size growths at the bass of each leaf. Are these the seeds? How and when do I harvest seeds from this plant?